If there is one Termite, there are many others nearby. Termites tend to swarm in colonies and most likely are building that colony underground on your property. Termites create their homes with a mixture of wood and soil which will end up looking like small mud tunnels on or around your Waldorf home. 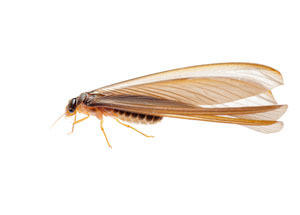 If you see even one Termite, you are in need of a Termite extermination. Termites are the pest immediately thought of when you think of a pest that does damage physically to your home. Termites feed, breed, and live within the wood of your home and will do costly damage to your home. If left untreated, they will begin to eat away at your home until the structure will no longer be sound. Treating a Termite infestation early on will save you a lot of time, money, and worry for yours and your family's safety. Calling a Termite exterminator to your Waldorf home is the only way to ensure your house will remain safe from Termite damage.